Every business owner wants to build their email list (well, they should). One of the best techniques for building your email list is to give away free stuff, in exchange for someone signing up. This gets a little bit tricky when you’re just starting up, because you want to start building your list, but you don’t want to be spending hundreds on flashy email marketing platforms (one day, maybe, but not right now). So you’ve probably signed up for MailChimp, or another cheap alternative. It usually works like this: Someone signs up for your email list to get the freebie > the freebie goes to their inbox. The problem with cheaper email marketing platforms is that they don’t have very robust features for organising lists. So if you’re giving away a lot of freebies (like me, every week! ), it’s just not practical to create a new list for every single freebie, it gets really complicated. One awesome way around this situation is to have the download link available immediately after they enter their email and sign up. You can do this in Wordpress by adding various Plugins, but I’ve been asked a lot how to do this in Squarespace: Don’t fret, because there’s a REALLY simple way to set this up in Squarespace! Fill in the form below to download your free motivational desktop backgrounds! This is just an example form, don't worry, you're not signing up for anything! Thanks! You can download your free Inspirational Desktop Backgrounds below. Keep an eye on your email for the password to the freebie library for access to more freebies! 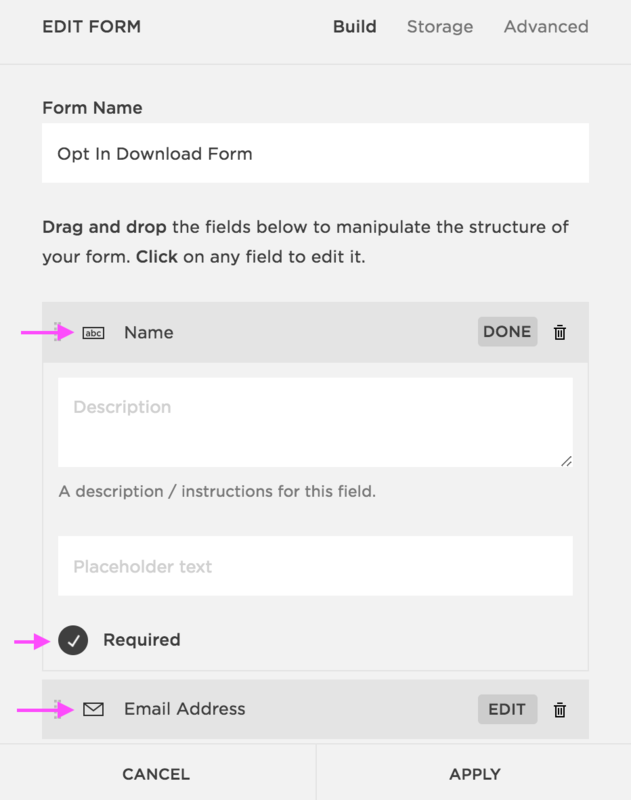 Add a Form Block and enter the details you want in the form. This would usually be Name and Email address. Make sure you make both of these required. Under Storage make sure you hook up the storage with your email address, your Google Drive or your MailChimp account - whatever hooks up with your email marketing platform. When the dialog box pops up, click Files and then upload your download file here. Once you've uploaded the file, make sure it's selected and click out of the dialog box. It should now be applied as a link to the "Download my freebie!" text!. Hit Apply and make sure you save your page, and then enter preview mode and test it out. Note: If you know HTML, there’s also a section called “Post Submit HTML”. You can use this section instead of the “Post Submit Message” section to format text and add a download button etc. This is optional. Now you can upload as many freebies as you like and have all of the subscribers go to the same list, without worrying about creating new lists for each freebie and sending the freebies via email. It's all contained on your website! If you are with an email provider that has a double opt-in, just be aware that this technique could cause people to not confirm their email addresses, and just take the freebie! MailChimp was double opt-in, but I believe last month (October 2017) they converted to single opt in, so you don't have to worry about this anymore - woohoo! Good luck building your lists! Let me know in the comments what has been the best technique you've used to build your list so far.